WANT KILLER COPY, QUICK SMART? PLUS the chance to bypass my waitlist, like a sassy VIP? -- the idea of a 6 to 10 week waitlist makes you want to raise the white flag and burrito yourself up in your favourite throw while you binge all 10 seasons of Friends (“WE WERE ON A BREAK!”). When you’ve got copy that’s not doing its job — and costing you prospects, engagement, and sweet, sweet mulah every hour it stays unchanged — you want that shizzle fixed, like, yesterday. Wondering what I can achieve in a day? Psst… want something that’s not on this list? Get in touch and I’ll let you know if you, me, and Buy My Day are a good fit. When you lock in a day with me, you’re buying my time (and undivided attention) and not a set of deliverables. I’ll work through things methodically, laying out the strategy first (e.g. a detailed sequence outline or sales page structure) and then tackling the copy, either from the top down OR by starting with the trickiest bits and pieces first. This way, * if * there are any bits of unfinished copy once our time together is up, you’ll have crystal-clear direction on what goes where and how to frame it. It’s like a colour-by-numbers… for business-owning-adults. When you buy my day, you get 100% of my focus. I put my phone on airplane mode, close down my tabs, stay well away from Giphy, and ignore the siren call of my fridge. For the 7 hours you’ve booked, my sole focus is getting your copy done, and getting it done well, so you can unleash it into the wild ASAP. Click any of the big pink buttons on this page and lock in a day that suits. You’ll need to make payment (via Stripe or PayPal) and sign a straight-forward agreement to make it official. When our big day arrives, I hunker down in my copy cave for 7 full hours and get to work, touching base via email or Zoom throughout the day as we’ve agreed. Thanks to a nifty little intake form (which I’ll swing your way as soon as you book) and a 60 minute kick-off call, we’ll both be crystal-clear on the goals you’re chasing and how I can help you reach them. 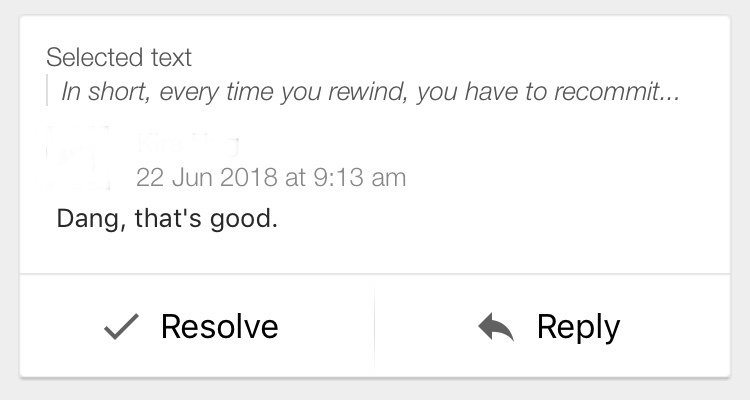 Once time’s up, I hand off your shiny new copy via the magic of Google Docs, along with detailed instructions and next steps for any bits and pieces I didn’t get finished. If you click any of the bright pink buttons on this page, you’ll wind up on my calendar, where you can see my availability for the next month. If you don’t see anything that suits, drop me an email with a list of dates that would. No promises, but I’ll see what I can do. Ideally, a day or two before you’re booked in. I LOVE having a little time for my thoughts and ideas to crystalise before I touch my keyboard. If that’s not possible, the morning of also works well — I just take an hour off between the end of the call and the start of the 7 hours so my thoughts can set in place. It depends! If we have super solid prep-time and we’re both feeling crystal-clear on what needs to be done, you can spend the day devoted to something else on your to-do list or watching Friends in your burrito-throw. If either of us wants to check things are on the right track, we’ll hatch a communication plan in our kick-off call. No problem whatsoever! 94% (seriously - did the math) of my existing clients are in the USA, so I’m used to working across time zones. We’ll use the magic of Acuity to find a time we’re both awake and functioning, and have our getting-to-know-you-and-your-project call then, whether it’s the day before or morning of our time together. I don’t start the clock until after this call is done, so I guarantee you won’t be disadvantaged. In fact, if you’re like my existing overseas clients, you might love the fact I work while you sleep. It means you get to wake up to the completed copy in your inbox. We can revise and perfect your shiny new copy throughout the day, but once I’m off the clock no further revisions are included. If it helps, 90% of my clients are so happy with what I deliver they don’t change a word (this sounds wanky, but it’s also the truth). You’ll know exactly what the next steps are at the end of our time together. 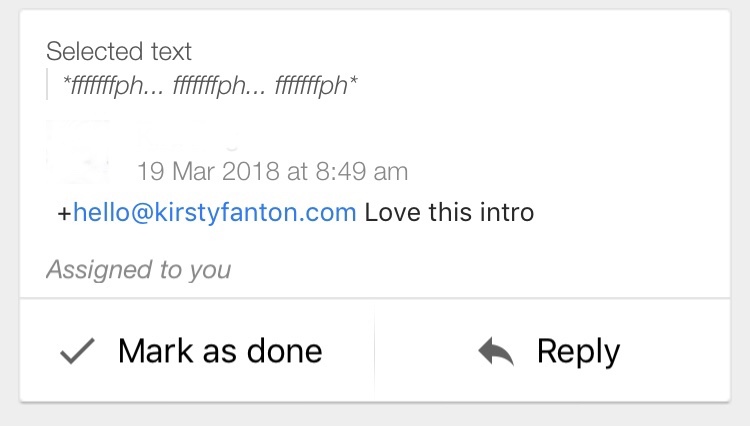 For example, if there are additional emails to write, you’ll know exactly how many and what goes in them; if there are sections of the sales page that aren’t complete, you’ll have detailed notes so you can fill them in quickly and easily. Of course, you’ll also have the option to book another day (or half day) if you’d like. Good question! My waitlist isn’t going anywhere (unless I start picking my nose on Zoom calls), but the big projects I take on have days in between deliverables where I’m left twiddling my thumbs. So I’m offering these days to you (and simultaneously reducing the amount of time I lose to sub-par TV and afternoon naps). Too right, mate, I bloody well am (#STRAYA). But almost all of my current clients are based in the US, which means USD has been my business currency since the end of 2017. MY QUESTIONS ARE ANSWERED AND I'M READY TO BOOK! Not only is she a creative bucket of fun to work with, she also understands the psychology behind every line of conversion copy. Kirsty does funny and smart. AND she delivers results. Results, as in, a $450K+ launch. My small goal was 20 registrants and my big goal was 100. I ended up with 110! 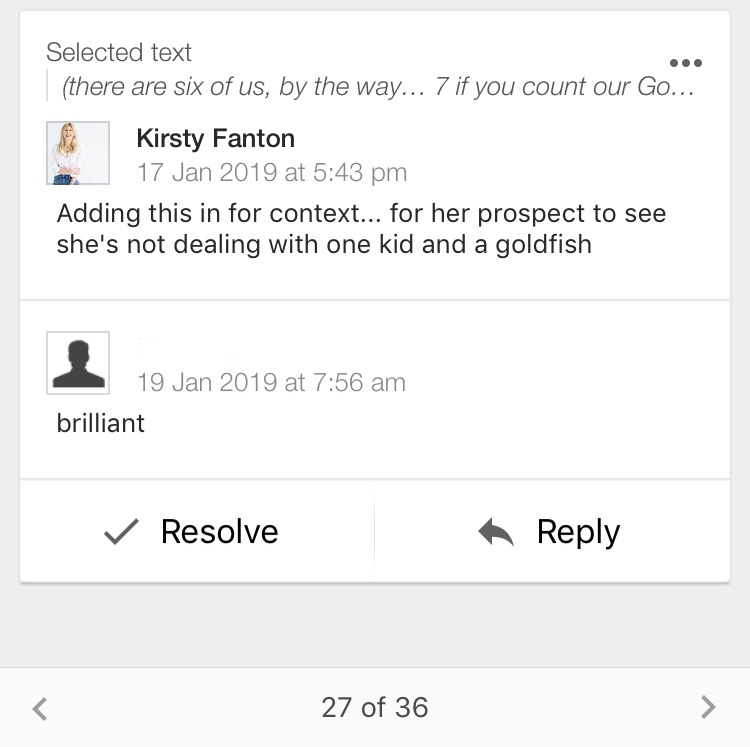 I liked having the hour chat beforehand to get on the same page, and I loved that Kirsty labeled the comments [on the sales page] so I could take those sections and apply them to my launch sequence after the day was over.